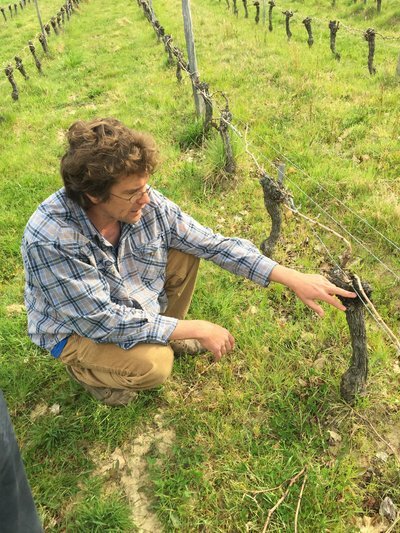 Julien had the chance to take over an exquisite plot of 9.5 hectares (23.5 acres) in 2015 in the appellation of Castillon-Côtes de Bordeaux. The majority of the vines are surrounded by forest and the vines themselves have never been treated with pesticides nor herbicides. Merlot makes up 80% of the surface area, while Cabernet Franc makes up the rest. The vines have been certified organic since 1993, which would put them amongst one of the few certified organic domaines in the region at that time. In the cellar, the wines are either aged in neutral oak or in stainless steel. In regards to the oak, Julien likes to use a 5000 liter cask so that the wine does not take on too much oak flavor. Only indigenous yeasts are used in the winemaking process, and nothing is added to the wine, other than a homeopathic dose of sulfites at bottling. The wines are neither fined nor filtered. Finding an organic wine from Bordeaux at these prices is rare, and we consider ourselves very fortunate to be able to share Julien's exceptional wines with you!